Named a Gift Book for the Discerning New Yorker by The New York Times In the Shadow of Genius is the newest book by photographer and author Barbara Mensch. The author combines her striking photographs with a powerful first-person narrative. She takes the reader on a unique journey by recalling her experiences living alongside the bridge for more than 30 years, and then by tracing her own curious path to understand the brilliant minds and remarkable lives of those who built it: John, Washington, and Emily Roebling. Many of Mensch's photographs were inspired by her visits to the Roebling archives housed at Rutgers University, where she pieced together through notebooks, diaries, letters, and drawings the seminal locations and events that affected their lives. Following in their footsteps, Mensch traveled to Muhlhausen, Germany, the birthplace of John Roebling; to Saxonburg, Pennsylvania, where Roebling established a utopian community in 1831; to Roebling aqueducts and bridges in Pennsylvania, Ohio, and New York; and to the Civil War battlefield in Gettysburg, Pennsylvania, where Washington Roebling, the son of the famous engineer, valiantly served as a Union soldier. 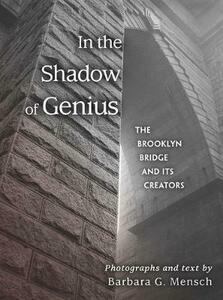 The book begins and ends with Mensch's unique photographs of the Brooklyn Bridge, including never-before-seen images captured deep within the structure. The book creatively fuses contemporary photography with the historical record, giving the reader a new perspective on contemplating the masterwork. Fernanda Perrone, Curator of Special Collections and the Roebling Family Archive at Rutgers University, has contributed a Foreword.